You’re a nameless heroine, awakened from a long slumber by the Ancient Codex, a talking book. He requires your help in order to restore the order in the world of Fairune, where illusion is reality. Three fairy-like Spirit Icons sealed away a great evil spirit at the center of the realm, but one day… the Spirit Icons disappeared and strange events began to occur. In the blink of an eye, the world of Fairune was overrun by monsters. As monsters and such have been running amok, it has been very dangerous, but this was kind of custom in the lands of Fairune as it occurs every one hundred years. Now, the task lies with the nameless heroine to seek out the three missing Spirit Icons and seal off the scourge once more. Fairune doesn’t offer an extensive soundtrack or something like voice talents, but presents itself as a genuine retro game with ambient music that fits the setting of the game and even accentuates Fairune’s straightforwardness. Every area, map and even the boss fight, offers a different soundtrack that perfectly fits the situation and is never boring to hear. Except for a limited amount of sound effects, Fairune doesn’t offer additional distinctive audio. 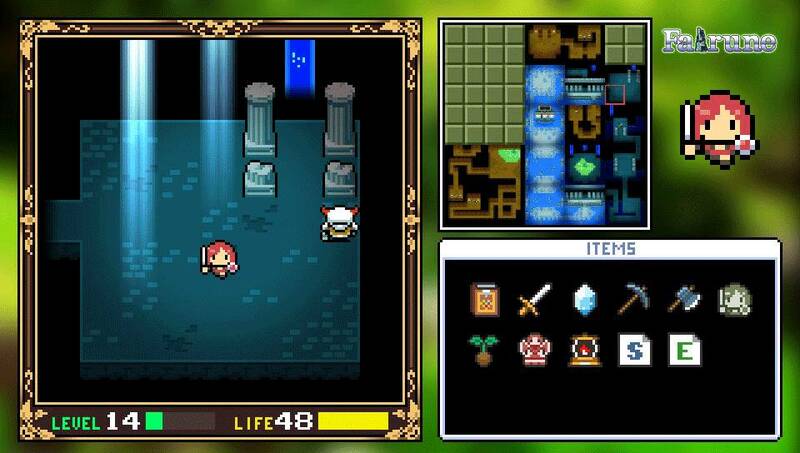 Fairune is an 8bit retro puzzle adventure game. Here we must really stress out the strong focus on puzzling. At first glance it might play like an old Zelda game and still you’ll have to solve problems and riddles for the majority of the game. It feels as if the game or at least the game world is one giant puzzle. The puzzles are fairly extensively present and must be solved to continue or open blocked paths. 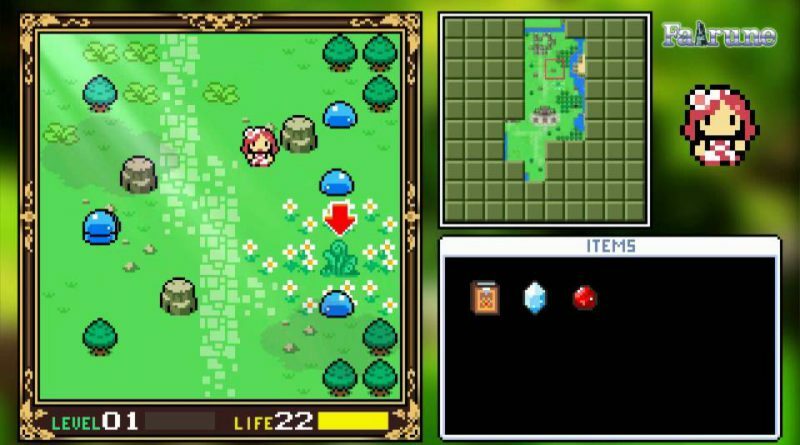 Fairune’s game world is built like a giant labyrinth where you can stumble into completely different additional maps offering more problems or puzzles to solve, ranging from finding hidden paths by paying attention to your surroundings, to simply locating and utilizing the right items or equipment at the right location. Combat doesn’t work in the conventional way you would expect. 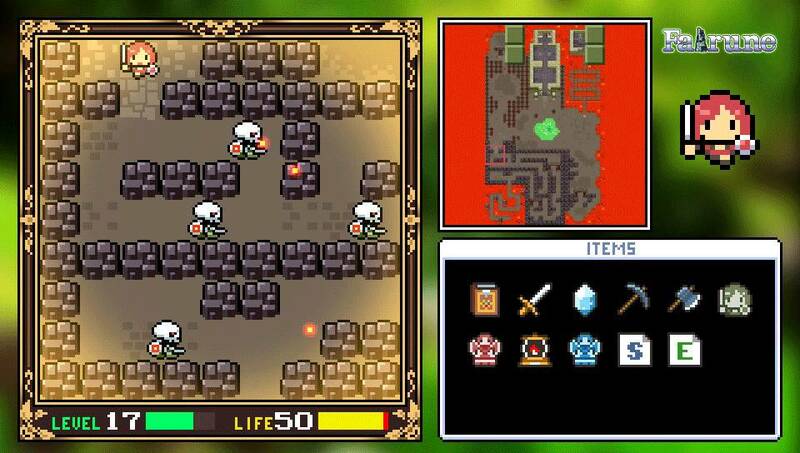 In Fairune you’ll run over the monsters and crush them. If a monster is the same level as you, it will be destroyed, and you will take one point of damage and receive some experience points. If the monster has a higher level, it will still be destroyed and you’ll receive a bit more experience points but receive more damage points in return, and if the monster is too high level, it will bump you back and cause considerable damage. This results in a constant search for new groups with the right kind of monsters to gain experience and level up. When you level up, you won’t receive overall attribute points as it will only increase your hit points and which kind of monsters you’ll be able to topple next. On the one hand, it makes the game a lot more strategic and makes you think it through before blindly rushing an opponent, while on the other hand, this would turn the game into a slow and tedious grind with a lot of backtracking. If you die, the game isn’t really punishing as you’ll respawn from where you originally started the game with your level and items intact. The downside is that you’ll probably need to backtrack considerably in order to get back to where you’ve died. Both combat and puzzles aren’t that extremely challenging but succeed in delivering a simple, straightforward old school experience. As there are no direct aids or tips on how to continue, and the game requiring a lot backtracking, a lot of players will probably pass on Fairune. 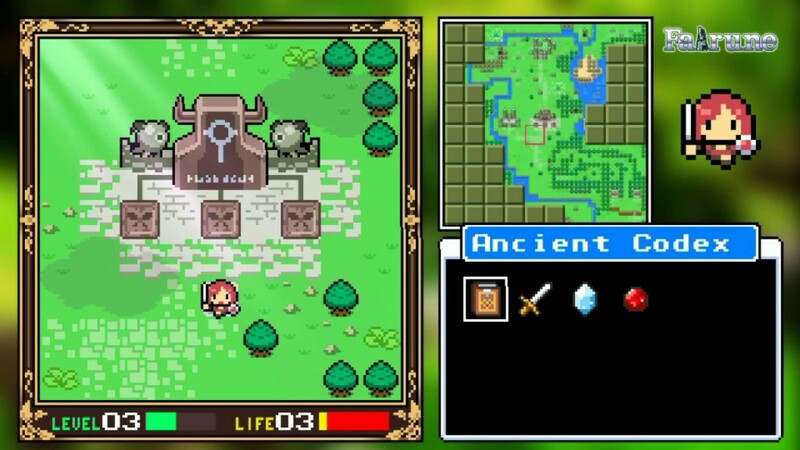 For players experienced in roleplaying and similar puzzle games, Fairune will be a walk in the park though. The game takes about 3 to 4 hours to complete if you take your time, while others will probably beat the game in less than 2 hours. There isn’t a real replay value except for the completionists who like to collect a platinum trophy or achievements. 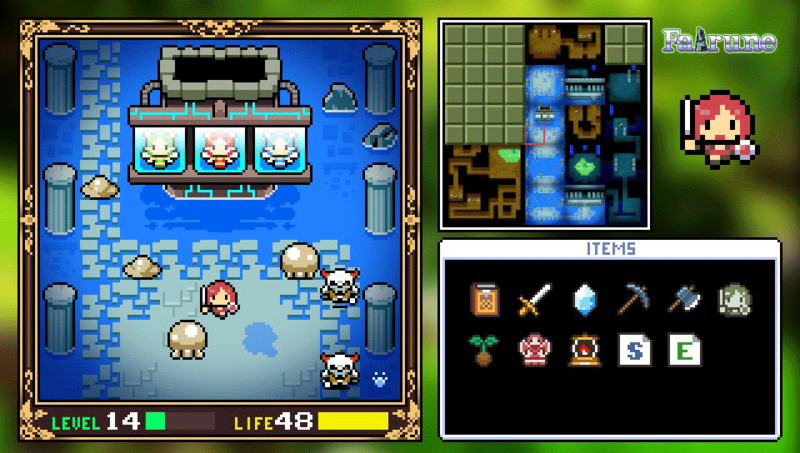 Fairune is a cute and fun homage to the old school RPG games with a lot of puzzling. Alas, it’s one of those games not meant for everyone as the game is a bit too complex for casual players to enjoy and only fans of the genre will be satisfied. So, if you’re looking for something to keep you busy on a long train ride or if you’re in the waiting room at the doctor, than Fairune might be an ideal appetizer. Being over 30 years old, I've been playing videogames since I've exchanged my pacifier for a game controller. I've only recently started reviewing games and it's incredibly fun to do and educational as I get to know a lot of new stuff about videogames and the industry. My favourite game genres are RPG's(strategy RPG, J-RPG,...), adventure, platforming, simulation and retro.